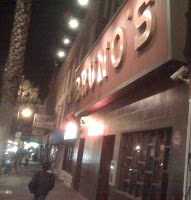 After a one week hiatus, I was back to Mission on Mission once again, this time Bruno’s at 20th Street & Mission Street. With its sizeable letters hanging from the building’s wall Bruno’s marquee stands out among the neighborhood’s low key store fronts. I knew this locale would be a late night affair so I decided to arrive at 8pm a bit later than my usual happy hour time. In the past, I’ve seen lines streaming out of Bruno’s and down the block. But, at 8 pm on Friday the doorway was empty and the club was vacant—but I guess that’s what I get for arriving one hour after the doors open. Known as a dance club, I was surprised by the amount of seating available in the bar area. 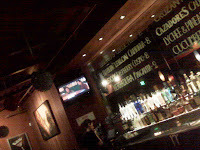 Opposite a long, gleaming bar on the left, plush red seating and short tables lined the wall. Dividing the space support beams were joined together with tall table tops to provide additional stool seating. This early in the evening, I had no problem snatching a stool at the bar and striking up conversation with Volek, the Polish bartender. It took me a while to get the dialog going. At first I thought he was being unfriendly but soon it occurred to me that he was probably unaccustomed to having an extended conversation with a patron—my guess is more often than not his interactions involve deciphering orders that are screamed over the bar. The way I was bombarding him with questions, he must have felt like a contestant on American Gladiators—ducking and dodging my barrage while trying to stay in the game. Either that or he thought I was there trying to pick him up. After he got over his initial apprehension, Volek kept me company as Bruno’s continued to fill up. There were a few private parties being hosted at the club including a 30th birthday party being held in the room upstairs—who knew that Bruno’s had an upstairs!? 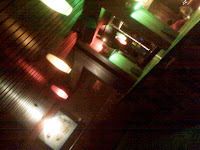 As I headed to the rear of the main room I discovered another small bar which led into the staircase to the 2nd floor. Apparently, according to Yelp reviews, this 2nd bar is an invaluable resource to getting you hands on some alcohol when the larger bar is four people deep. Across from the second bar a short hallway with a small room branching off of it, provided an intimate refuge to patrons looking to escape the voluminous crowds that overtake the larger rooms. Beyond the smaller den, was yet another vast area hosting a dance floor and DJ booth. According to Volek, some weekends the club has all three rooms playing different types of music. Between 9:30 and 10pm Bruno’s started to fill up—fast! As the cover charge took effect at 10pm, a line started to form outside the entrance. The music was excellent and the energy inside was lively and fun. I soon realized why there were so few barstools—they want people on the floor, dancing and mingling—not blocking the bar or playing wallflower. The second room was still sparse but a few brave souls were starting to shake their bottoms on the dance floor. At this point I had some company – and some entertainment – as my friends Lyle, Todd and Paul cruised in to join the Mission. Together we shared lively commentary on the crowd as ladies, dressed to the nines, flashed their assets to the bartenders and guys with polished dancing shoes popped their collars and prowled the club in search of the girl that might actually go home with them. As the hour grew later, Missionites in hoodies and jeans began to join the crowd as out-of-town clubbers in their loud trendy “I’m going out in SF tonight” gear, stopped talking and started dancing. With the beats thumping and the liquor flowing I watched courage swell—guys started to strike up conversations with the ladies while the suavest of the bunch, managed to get a few on the dance floor. Ah, to be 25 and horny again… it sure was entertaining to watch. I called it a night around 10:45pm figuring I’d had enough and realizing that the only other thing I’d get out of Bruno’s was to be an obstruction on or to the dance floor. 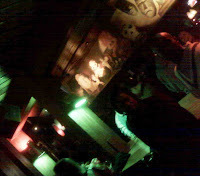 Though Bruno’s is very much a meat market it does offer a great late night option for dancing in the Mission. 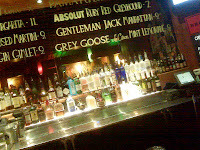 The staff was attentive and Volek, after making friends earlier in the evening, made sure my drink was never empty. With $5 cover on Friday nights and a $10 cover on Saturdays the fee seems reasonable with what you get on the inside, a good place to go with a group to get your groove on, listen to decent DJs and to meet the under 30 horny crowd. horny and over 25, way over in your case, and your the dirty old man at the bar.